Johnson & Johnson (JNJ) "Trading Transparency"
This past Thursday (12/24/09) I sold a portion of my 3M (MMM) holding as it had appreciated to a 90% gain from my initial purchase. (I wrote about it here.) Having only 7 positions in my portfolio, well under my maximum of 20 holdings, this partial sale of my 3M holding as it appreciated gave me a 'buy signal' to be adding a new holding to my portfolio and to transfer some of my cash into equity. With that in mind, I chose to purchase 50 shares of Johnson & Johnson (JNJ) today at $64.93/share. The size of the purchase was based on my own calculation of the average size of my holdings in my trading account and what 125% of that size would allow me to purchase. Let's take a closer look at this bluest of blue-chip stocks Johnson & Johnson (JNJ) and why it might represent a good addition to my growing stock portfolio. "...engages in the research and development, manufacture, and sale of various products in the health care field worldwide. Its Consumer segment provides products used in baby care, skin care, oral care, wound care, and womens health care fields, as well as nutritional and over-the-counter pharmaceutical products...."
Johnson and Johnson is not the picture of uninterrupted growth that I prefer to find in my investments. It is a picture of a large growth stock with quality brands that due to the economic slowdown presents a compelling opportunity for investment from my perspective. On October 13, 2009, JNJ reported 3rd quarter earnings. Revenue dipped (5.3)% for the quarter to $15.08 billion, down from $15.92 billion the prior year. Earnings however came in stronger at $3.35 billion or $1.20/share, compared to $3.31 billion or $1.17/share the prior year. The company beat expectations of $1.13 on earnings, but missed on revenue expectations which had been estimated to come in at $15.19 billion. Longer-term, looking at the Morningstar.com "5-Yr Restated" financials on Johnson & Johnson, we can see the relatively steady growth in revenue from $47.3 billion in 2004 to a peak of $63.7 billion in 2008 before dipping to $60.5 billion in the trailing twelve months (TTM). Earnings have increased in an uninterrupted fashion from $2.74/share in 2004 to $4.58/share in the trailing twelve months. Dividends have been paid and have been increased annually from $1.10/share in 2004 to $1.80/share in 2008 and $1.90/share in the TTM. Outstanding shares increased from 2.99 billion shares in 2004 to 3.00 billion in 2005 before beginning a steady descent as the company bought back shares dippping to 2.84 billion shares in 2008 and 2.79 billion in the TTM. Free cash flow has grown slowly from an impressive $11.5 billion in 2006 to $12.6 billion in the TTM. If we look at the balance sheet as presented on Morningstar.com, we can see that JNJ has $11.9 billion in cash, $23.7 billion in other current assets for a total of $35.6 billion in current assets. Compared to the $19.2 billion in current liabilities this yields a current ratio of 1.85. The company has a significant but apparently manageable long-term liabilties of $21.9 billion. In terms of valuation, according to the Yahoo "Key Statistics" on Johnson & Johnson, the company has a market cap of $179.18 billion. The trailing p/e is a modest 14.18 with a forward p/e (fye 28-Dec-10) estimated at 13.17. The PEG is reported at 1.87 suggesting that the 5 yr expected growth rate is in the single digits. Yahoo reports that there are 2.76 billion shares outstanding and that 21.33 million of them as of November 30, 2009, are out short. This represents only 1.8 trading days of volume. The company pays a forward dividend of $1.96/share with a yield of 3.00%. The dividend is well-covered by earnings with a payout ratio of only 41%. The company last split its stock in June, 2001. 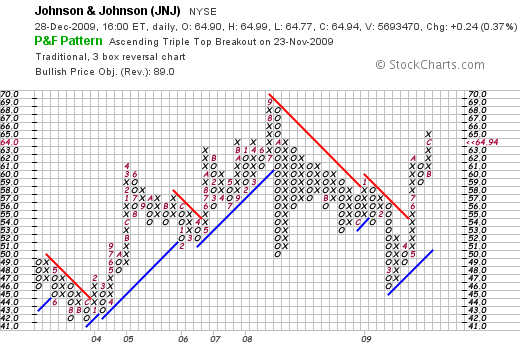 Examining a 'point & figure' chart on Johnson & Johnson (JNJ) from StockCharts.com we can see that the stock has rallied from a low of $42/share in December, 2003, to a peak of $69 in September, 2008, before dipping to a recent low of $46 in March, 2009. Since that time, the stock price has rallied strongly to break through resistance levels to its current level of $64.94/share. To summarize, my partial sale of shares of my 3M stock entitled me to add a new position. 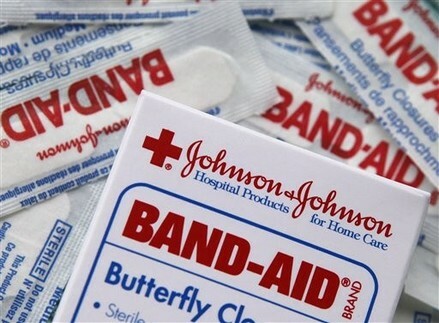 In these uncertain times, Johnson & Johnson offers some comfort in its solid and growing dividend history, low p/e, steady history of revenue growth interrupted only by a recent dip in revenue, and strong free cash flow generation with a solid balance sheet. Johnson & Johnson has a whole flock of brands from Tylenol to Aveeno to Splenda, Sudafed and Motrin. Still having bruises from the market turmoil, it is nice to buy some Band-Aids to cover over some of my superficial financial injuries! Thanks again for stopping by and visiting! If you have any comments or questions, please feel free to leave your comment here or email me at bobsadviceforstocks@lycos.com. One of the basic parts of my portfolio management system is to limit losses by selling declining stocks quickly and completely at set loss limits, and to capture the profits of appreciating stocks by selling them slowly and partially at appreciation targets after an initial purchase. On the downside I sell all of my shares if after an initial purchase the stock declines 8%. If I have sold a portion of a stock after an initial purchase after it had reached a single appreciation target (the first appreciation target being at a 30% appreciation level), then I sell all of the remaining shares if the stock should decline to break-even. If I have sold portions more than one time, then I set the tolerance on a price decline to 1/2 of the highest appreciation percentage that the stock was sold. For instance, if I have sold twice at both 30% and 60% appreciation levels, then the remaining shares would be sold if the stock should decline to 1/2 of the 60% appreciation target or at a 30% appreciation point (not 1/2 of the highest price but the 1/2 of the highest appreciation %). On the upside, my appreciation targets remain at 30, 60, 90, 120, 180, 240, 300, 360, 450% etc. appreciation levels. At each of these levels, should one of my holdings reach it, my approach has been and continues to be to sell a little of that holding--I use 1/7th of the remaining shares (rounded downward). Currently the top performing position in my portfolio has been my shares of 3M (MMM). I purchased 33 shares on 3/3/09 at a cost basis of $43.64/share. On April 24, 2009, I sold 5 shares (approximately 1/7th) of my holding (in retrospect I really should have sold only 4 shares--as I prefer to round out downward) at a price of $55.21. This represented the first partial sale with a gain of $11.57 or 26.5%. On July 27, 2009, I sold 4 shares of my remaining 28 shares (1/7th of holding) at a realized price of $67.92. This represented a gain of $24.28 or 55.6% (after costs of transaction included). This was for my 2nd appreciation target of 60% price gain. At each of these sales on gains, I purchased a new holding, utilizing this "good news" trigger as a signal to be expanding my exposure to equities. Today, with 3M (MMM) trading at $82.87, reaching a price appreciation of $39.23 or 89.9%, I sold 3 shares of my remaining 24 shares (approximately 1/7th of my holding). This sale resulted in a buy signal for me giving me that 'permission slip' to add a new holding. I shall be waiting over the Christmas holiday and considering which new stock I might now wish to be purchasing to add to my portfolio. Thank you for bearing with me as I went through this rather wordy explanation. Sometimes, with the paucity of trading that I do in my account, it doesn't appear like anything is going on. To the contrary, I am continuously monitoring my stocks and slowly building up a portfolio depending on the actions of my own holding in this rather difficult market. Research in Motion, Ltd. (RIMM) "Revisiting a Stock Pick"
I read with interest when another one of my 'old favorites' showed up the other day on the top % gainers lists on the back of a terrific earnings announcement. Research in Motion (RIMM) closed at $70.00, up $6.54 or 10.31% on December 18, 2009. I do not own any shares of this stock. RIMM has been an early favorite of mine, having first written up Research in Motion on this blog on September 26, 2003, when the stock was trading at $38.24. Adjusted for a 2:1 split in June, 2004, and then a 3:1 stock split in August, 2007, this workes out to a split-adjusted 'pick price' of $6.37. With Friday's close at $70.00 this works out to an appreciation of $63.63 or 999% since writing up the stock. I revisited Research in Motion (RIMM) on August 19, 2007, when the stock was trading at $220.52. Adjusted for the 3:1 stock split a couple of days after posting this entry, the stock pick was made at a split-adjusted price of $73.51, so RIMM has essentially traded sideways since that point, and is actually a few dollars lower than the blog entry of 2007. Let's again revisit this stock and look at the latest earnings, the fundamentals underlying this stock, some valuation numbeers, and a 'point & figure' chart. On December 17, 2009, Research in Motion announced 3rd quarter results. For the quarter ended November 30, 2009, net income was reported at $628.4 million or $1.10 per share, upsharply from net income of $396.3 million or $.69 per share the prior year. Revenue climbed 41% to $3.92 billion in the quarter. Equally important the company beat expectations for the quarter which according to FactSet Research were for earnings of $1.04 per share on revenue of $3.78 billion. 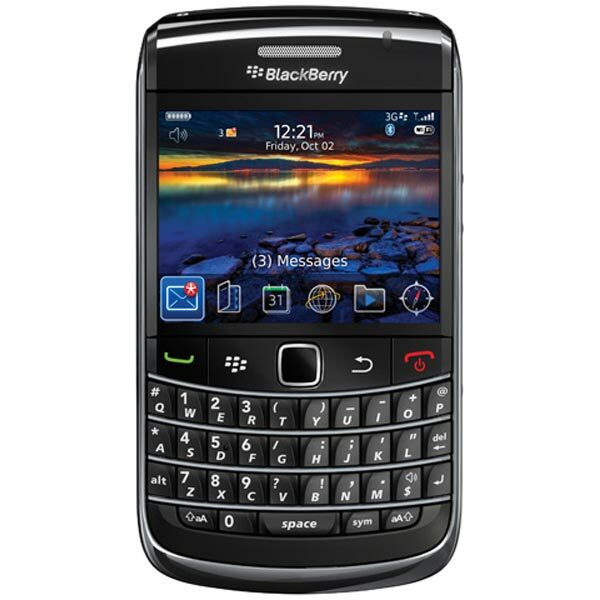 The company shipped 10.1 million smartphones in the quarter with net new subscribers of 4.4 million. This also exceeded expectations of 9.5 million in shipments with 4.1 million new subscribers. To top off the earnings report, RIMM raised guidance for the upcoming quarter to sales of $4.2 billion to $4.4 billion, up from prior guidance of $4.0 to $4.03 billion. This is also ahead of analysts' expectations of $4.1 billion. Profits was guided to $1.21-$1.31, also ahead of prior guidance of $1.00-$1.08 and also ahead of analysts' expectations for $1.12 in earnings. Let's take a look at the longer-term results as reported on the Morningstar.com "5-Yr Restated" financials page on RIMM. Here we can observe the steady growth in sales from $1.35 billion in 2005 to $11.1 billion in 2009 and $13.2 billion in the trailing twelve months (TTM). Earnings have also steadily grown from $.36/share in 2005 to $3.30 in 2009 and $3.55/share in the TTM. Outstanding shares have been stable and actually have declined due to company buy-backs. In 2005, there were 587 million shares which dropped to 574 million by 2009. Free cash flow has been positive and has increased from $482 million in 2007 to $1.05 billion in the TTM. Looking at the balance sheet, we can see that RIMM has $1.08 billion in cash and $4.13 billion in other current assets. This total of $5.21 billion in cash and other current assets, when compared to the $2.17 billion in current liabilities works out to a Current Ratio of 2.4. The company has almost no long-term liabilities with $71.1 million only reported on Morningstar. According to Morningstar, RIMM sells with a forward p/e of 16.1. Fidelity has RIMM with a trailing p/e of 19.8 and the stock does not pay a dividend. If we examine a 'point & figure' chart on Research in Motion (RIMM) from StockCharts.com, we can see that the stock price is very volatile.The stock traded as high as $148 in June, 2008, only to dip as low as $36 in December, 2008 through March, 2009. 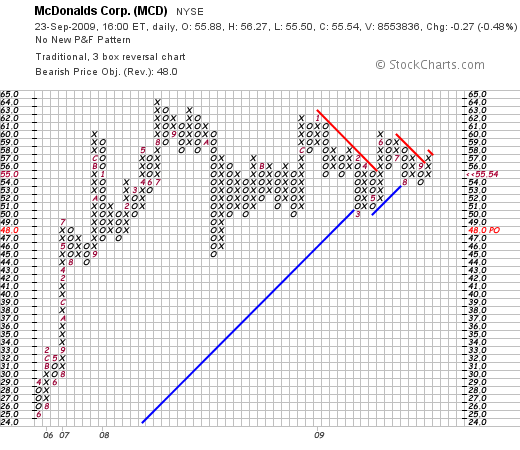 The stock is still trading below resistance lines but appears to be moving bullishly higher from its prior lows. To summarize, Research in Motion (RIMM) reported a very strong earnings report with both strong growth in revenue and earnings with numbers that both exceeded analysts' expectations. To top it off, the company raised guidance for the upcoming quarter also above analysts estimates. Longer-term, the company has steadily and rapidly grown earnings, revenue, and free cash flow while maintaining and reducing outstanding shares. However, they do not and haven't paid cash dividends. Their balance sheet is solid with a current ratio of over 2 and nominal long-term debt. The stock chart demonstrates the high volatility of this stock which appears to trade with a high beta. Valuation does not appear excessive in the high teens with the incredible record of growth this company has reported. Perhaps a better question is the performance of the RIMM smartphone platform with the iPhone from Apple (AAPL), and the Google Droid phone by Motorola (MOT) sponsored by Verizon (VZ). Apparently all three of these platforms have been taking share from Windows Mobile-based phones. With smartphones representing only 18% of all cell phones, there appears to be room for growth for all three major platforms. RIMM deserves a spot in my blog if not eventually a spot in my own trading portfolio! For now, I shall wait for my own holdings to either reach an appreciation target allowing me to purchase a new holding or dip so that they need to be sold completely. I continue to utilize my own portfolio to literally direct my actions in the market. Thanks again for visiting! If you have any comments or questions, please feel free to leave them right on the website or email me at bobsadviceforstocks@lycos.com. I put together a podcast this evening on Medtronic (MDT). Please click HERE to listen to me discussing my recent entry and a poem by Carl Sandburg! After shrinking for four straight quarters, the U.S. GDP expanded by 2.8% in the 3rd quarter, reversing the longest straight decline for the usually robust United States economy since the Great Depression of the 1930's. Even so, the economic recovery remains fragile. Latest figures from the post-Thanksgiving "black Friday" shopping suggest that while individual spending dipped 8% per person, total weekend spending actually climbed 0.5% from last year. On the jobs front, all we see is that the rate of decline is diminishing, lending hope that an improvement may actually be seen in the not-too-distant future. However, news that initial jobless claims came in at 466,000 last week is only good news from the perspective that this was the lowest level since September, 2008. It is still hard in absolute terms to become very excited about the news that another 1/2 million Americans are submitting new claims for unemployment! Meanwhile gold is soaring to near-record levels hitting $1,136.80/ounce on Friday after pulling back in the face of the Dubai World events. On top of this the dollar has shown continued weakness, dropping to a 14 year low against the Yen as the Fed continues to utilize rock-bottom interest rates to try to kickstart the economy. In spite of the slowly turning economy in the United States, politicians like Ron Paul are seeking to exert more influence over the machinations of the Fed. Meanwhile, Bernanke and the Fed are trying to fight back to retain independence. To top it off there is now talk of a second stimulus while the effects of the watered-down first stimulus, most still unspent, is debated. With all of that in mind, I do not believe that many of the companies we look for on this blog will go out of business and that the stock market will never recover. I continue to look for quality companies reporting good earnings with good track records. One such company is Medtronic (MDT), a stock that I first reviewed six years ago, on November 13, 2003 (excuse my 'title' which mistakenly says 2002.) I do not currently own any shares of Medtronic (MDT) but my wife does own a few shares (amounting on one year's contribution) to her IRA that she purchased several years ago. Medtronic (MDT) closed at $42.99 on November 27, 2009, down $(.19) or (.44)% on the day. "...develops, manufactures, and sells device-based medical therapies worldwide." These devices address cardiac rhythm problems, neuromodulation treatment, diabetes treatment, surgical treatment and physio-control equipment. 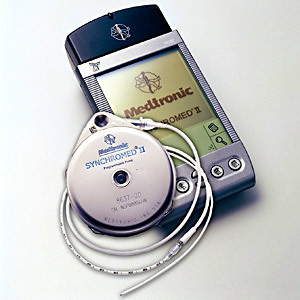 Medtronic made the news last week after reporting surprisingly strong 2nd quarter 2010 results. Revenue for the quarter came in at $3.84 billion, up 8% from last year's $3.57 billion. Earnings for the quarter came in at$868 million or $.78/share in the quarter ended October 30, 2009, up from $547 million or $.48/share the prior year. Adjusted income was $850 million or $.77/share. Financial results should never be reviewed 'in a vacuum'. It certainly is important whether the company reports positive or negative growth, but at least as important is the expectations that were held by analysts and others regarding the event as the event itself. In this case, analysts had been expecting revenue of $3.75 billion and Medtronic exceeded expectations coming in at $3.84 billion. In terms of the earnings figure, analysts had expected earnings of $.74/share, and the company again exceeded these expectations with its $.77/share (adjusted) result! In today's difficult economic environment, fewer companies are offering earnings guidance, so for a company like Medtronic (MDT) to not only offer guidance, but also to raise guidance to a range of $3.17 to $3.22 a share, from prior projections of $3.10 to $3.20/share ahead of analysts forecasts of $3.15/share is also quite encouraging. In general, I prefer to identify companies that have uninterrupted revenue and earnings growth for inclusion in this blog. But it would be inopportune to ignore companies like Medtronic (MDT) which have indeed experienced a dip in recent financial results in the face of a global slowdown rivaling the Great Depression, yet now appear to be returning to their regular pattern of growth. These are companies that need to be identified by a successful investor. Reviewing the Morningstar.com "5-Yr Restated" financials on Medtronic (MDT), we can see that revenue growth has been steady from $10.1 billion in 2005 to $14.6 billion in 2009 and $14.8 billion in the trailing twelve months (TTM). Earnings grew steadily from 2005 at $1.50/share to 2007 when they reported $2.40/share. However, since that time earnings have dipped to $1.93/share in 2009 and $1.69/share in the TTM. However, with the current report discussed above, hopefully, this trend is being reversed. Medtronic (MDT) has continued to pay dividends and to increase that payment regularly without interruption from $.34/share in 2005 to $.75/share in 2009 and $.77/share in the TTM. Outstanding shares have been tightly controlled and actually reduced with 1.2 billion in 2005, graduallly decreased each year to 1.12 billion in the TTM. Free cash flow has been positive and increasing (except for a mild dip in the TTM) from $2.4 billion in 2007 to $3.38 billion in 2009 (and $3.18 billion in the TTM). The balance sheet appears solid with $1.0 billion in cash and $6.3 billion in other current assets with only $3.1 billion of current liabilities yielding a 'current ratio' of 2.35. Morningstar reports the company with another $7.3 billion in long-term liabilities. In terms of valuation, looking at the Yahoo "Key Statistics" on MDT, we find that this is a large cap company with a market cap of $47.58 Billion. The company sells with a trailing p/e of 21.65 with a forward p/e of 12.28. Even with the relatively 'rich' valuation of its p/e, the PEG ratio (5 yr expected earnings) comes in at a reasonable 1.24 (from my perspective). Yahoo reports 1.11 billion shares outstanding with 1.10 billion that float. As of November 13, 2009, there were 13.74 million shares out short representing only 2 days of average trading volume, below my own arbitrary 3 day rule for significance for the short interest ratio. The company pays a forward dividend rate of $.82/share with a forward annual dividend yield of 1.9%. The payout ratio is a fairly 'safe' 40%, and the last stock split was a 2:1 split more than 10 years ago paid in September, 1999. 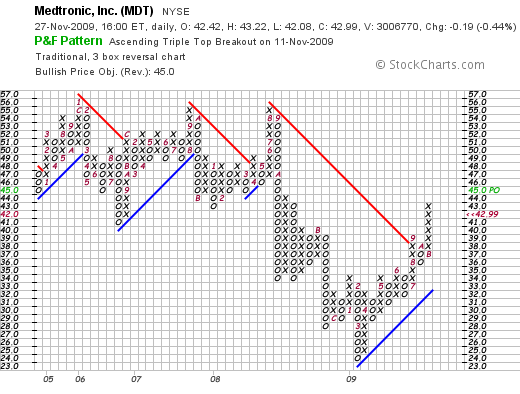 Finally, if we take a look at the Medtronic (MDT) 'point & figure' chart from StockCharts.com, we can see that the stock was trading in a fairly tight range between $41 and a high of $56 (that it hit three times) before turning lower in October, 2008, along with the rest of the market, to bottom at $24/share in February, 2009. The stock has rallied strongly since, and hit a recent level of $43/share last week before pulling back a bit on Friday. To summarize, Medtronic (MDT) appears to be recovering and regaining some of its previous growth characteristics that suffered during the recent economic slowdown. They reported a terrific quarter and expressed optimism about the future by raising guidance. Longer-term, they have continued to grow their revenue while experiencing a mild set-back in earnings, increased their dividend, and have retired shares on a regular basis. They have outstanding free cash flow growth, a solid balance sheet, and a chart that is looking more optimistic. On a Peter Lynch level, with an aging population struggling with obesity, heart disease numbers may well soar, and recently predictions of a doubling of diabetes victims have recently been announced. Against all of this is the perceived threat of healthcare reform that may introduce more regulation into healthcare in America but will also bring 30 to 40 million new patients into doctors' offices and hospitals. I do not own any shares of MDT now, but this is the kind of stock I would be purchasing if I had the 'signal' from my own portfolio to be buying shares in a new holding. Thanks again for stopping by and visiting my blog! If you have any comments or questions, please feel free to leave them right on the website or email me at bobsadviceforstocks@lycos.com. Click HERE for my podcast on Meridian Bioscience (VIVO) and a poem by Robert Frost, "Directive". If you have any comments or questions, please feel free to leave them here or email me at bobsadviceforstocks@lycos.com. 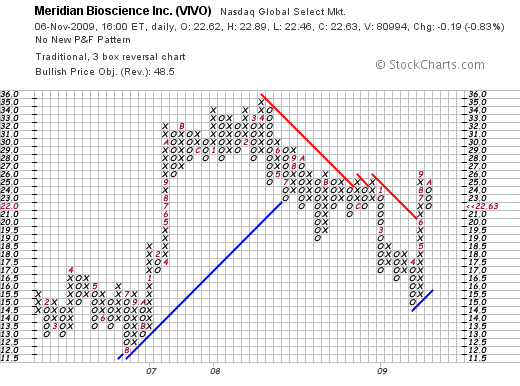 Meridian Bioscience (VIVO) "Revisiting a Stock Pick"
As I slowly gain some confidence in this difficult stock market, I wanted to take another look at one of my past favorites, Meridian Bioscience (VIVO). I do not currently own any shares, but have owned shares on an off since first writing about this stock on this blog on April 22, 2004. "...a life science company, engages in the development, manufacture, sale, and distribution of diagnostic test kits primarily for respiratory, gastrointestinal, viral, and parasitic infectious diseases." Probably one of the biggest medical challenge facing this nation and the rest of the world is the 2009 H1N1 Flu (also called "Swine Flu") epidemic. It does not appear that this pandemic has yet peaked. "The research was done with strains of the virus cultured from positive respiratory specimens, Meridian said in a news release. The test hasn’t been proven yet to distinguish positive results from clinical specimens." The swine flu epidemic is clearly urgent enough to get the FDA to expedite this labeling permission. But the timeliness of this particular product is not what really attracts me to this company. It is just an added "plus" from my own perspective. This company has consistently produced solid financial results for at least as long as I have been following this stock, which is for longer than five years. First of all, let's take a look at the latest quarterly result. On July 16, 2009, Meridian Bioscience (VIVO) reported 3rd quarter 2009 results. Sales for the quarter came in at $38.2 million, up 16% from the $33 million reported in the prior year. Earnings cane in at $8.5 million, up 10% from $7.8 million the prior year and diluted earnings per share increased 11% to $.21/share from $.19/share previously. The company also reaffirmed guidance for full 2009 year of revenue between $140 million and $144 million and earnings between $.77 and $.81/share. On September 15, 2009, the company continued its optimistic assessment of its opportunities providing 2010 guidance of sales between $160 and $165 million, and earnings to be between $.90 and $.95/share. Let's take a longer-term look at some more Meridian (VIVO) numbers and I think you will agree with me that the company, although small, has been generating some pretty phenomenal results. Looking at the Morningstar.com "5-Yr Restated" financials, we can see that VIVO has steadily increased its revenue from $80 million in 2004 to $142 million in the trailing twelve months, without 'missing a beat'! Earnings during this period have also steadily improved from $.30/share in 2004 to $.80/share in 2008. Surprisingly for such a small company, they pay a significant dividend and have also increased it yearly from $.17/share in 2004 to $.53/share in 2008 and $.62/share in the TTM. The company has increased its float somewhat from 34 million shares in 2004 to 40 million in 2006, but since 2006 has only increased shares to 41 million. Free cash flow has been positive and growing with $19 million reported in 2006 increasing steadily to $26 million in 2008 and $29 million in the TTM. Per Morningstar.com, the balance sheet for this company is gorgeous with $53 million in cash which by itself could pay off both the $12.2 million in current liabilities as well as the nominal $1.2 million in long-term liabilities reported more than 4x over!. If we include the $49 million in other current assets, the current ratio jumps to over 8.0. Looking at "Key Statistics" on Meridian from Yahoo, we can see that this is a small cap stock with a market capitalization of only $916.99 million. The trailing p/e is a bit rich at 29.50 (clearly the market is putting a premium on these financials), and the forward p/e (fye 30-Sep-10) is also a bit rich at 24.60 with a PEG reported at 1.64 (5 yr expected). The company is reported to have 40.52 million shares outstanding with 39.42 million that float. Based on its recent average daily volume of 258,803 shares, the 2.66 million shares out short represents 9 trading days of volume (the short ratio), well above my own '3 day rule' for significance. There could be a rush to cover these short shares if Meridian comes out with better than expected results. However, on the other hand, there are a lot of stockholders betting against this company especially in light of its relatively rich valuation. The dividend as I have noted, is not insignificant with $.68/share being the forward dividend payment yielding 3%. The company does pay out a significant portion of its earnings in dividends with a 79% payout ratio. The company last split its stock May, 2007, when it declared a stock dividend to effect a 3:2 split. 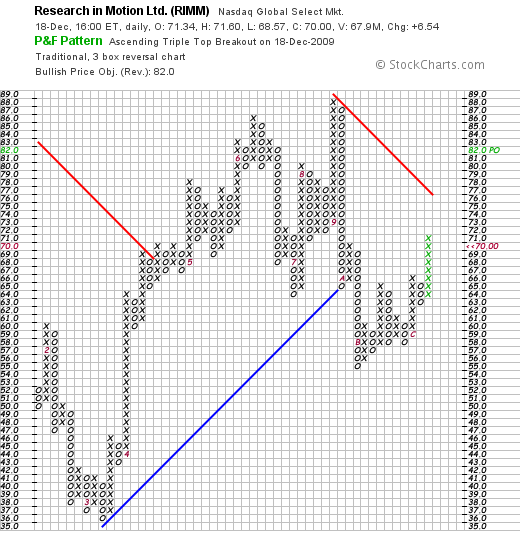 Looking at a recent "point & figure" chart from StockCharts.com on Meridian, we can see that the stock made a terrific move higher between August, 2006, when the stock was trading at $12 to a peak of $35 in April, 2008. The stock sold off with the rest of the market dipping to a recent low of $15.00 in April, 2009, only to rally past recent resistance and currently trades at $22.63/share. The stock does not appear currently over-extended relative to its apparent consolidation over the past two years of its big move in 2007. To summarize, Meridian (VIVO) is a timely stock with an interesting diagnostic product line that may benefit from the current Swine Flu pandemic hitting our nation. They have been a consistent performer with steadily increasing revenue, earnings, and even dividends. The company is financially solid with positive and growing free cash flow and an impressive balance sheet. If anything, the company is priced a bit rich but with the sideways move the stock price has been making the past two years, and the recent strength it has shown, it may well be a timely stock to consider. Thanks again for stopping by and visiting my blog. If you have any comments or questions, please feel to leave them right here on the website or drop me a line at bobsadviceforstocks@lycos.com. Coca-Cola (KO) and Church & Dwight (CHD) "Trading Transparency"
Earlier this week (10/20/09) I sold my 50 shares of Coca-Cola (KO) at a price of $53.38 and purchased 48 shares of Church & Dwight (CHD) at a price of $55.61. As part of my own "trading transparency", I wanted to share with you my own thoughts behind this decision and update you regarding my current strategy. 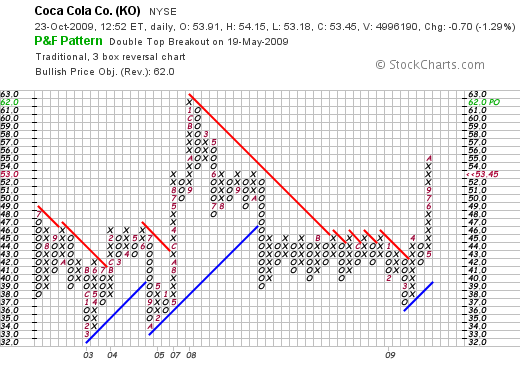 There is no doubt in my mind that Coca-Cola (KO) remains one of the top international brands of 2009 and of all time! Like my own admiration for Colgate Palmolive (CL) that I have written about previously, I would like to add Coke to my portfolio again some time in the future. However, this week the company announced 3rd quarter results that were a little 'flat' and the market responded with a pull-back in the stock price. During the quarter worldwide case volume grew 2% including 37% growth in India as well as a 15% growth in China. In North America, however, sales slipped 4% with a 5% dip in soft drink sales. Perhaps more importantly the company failed to meet expectations of $8.11 billion in revenue, coming in instead at $8.04 billion (down from $8.39 billion the prior year). Earnings of $.81/share were also flat with last year's $.81 but did meet estimates according to Thomson Reuters. The stock has a great deal of support in the $40-$42 range technically, but wouldn't you view the chart with the recent rise from $43 to a high of $55 over the last 5 months a bit vulnerable to retracement? Anyhow, that was my thought and I pulled the plug on Coke. But what do do with the proceeds? One of the more recent stocks I have reviewed here on Stock Picks Bob's Advice is Church & Dwight (CHD), another consumer company that might be considered a reasonable replacement for a stock like Coke. As I wrote above, I purchased 48 shares of Church & Dwight on 10/20/09 at a price of $55.61. As I write, CHD is trading at $55.35, so I am a few cents under my purchase price. On August 4, 2009, Church & Dwight reported 2nd quarter results. (They should actually be reporting their 3rd quarter numbers soon as it has been almost 3 months since that report!) During the second quarter revenue climbed 5% to $623.1 million from $594 million the prior year. Earnings came in at $58.2 million or $.81/share as compared with last year's $45.8 million or $.66/share. Perhaps more importantly, analysts had forecast earnings of $.79/share on revenue of $611.5 million according to Thomson Reuters. Thus, unlike Coke, which met estimates on earnings and missed on revenue forecast, CHD exceeded both of these estimates. In addition, the company raised guidance for full-year earnings from $3.30 to $3.35/share to $3.35 to $3.40/share. Analysts had been predicting $3.36/share. If that wasn't enough the company also cast a strong vote on the financial strength of the company by significantly increasing their dividend from the former payment of $.09/share to $.14/share. Thus in one single announcement, the company did what I have lightly referred to a trifecta-plus! That is they reported strong earnings and revenue numbers that beat expectations on both, they went ahead and raised guidance, and then to top that off increased the dividend as well! 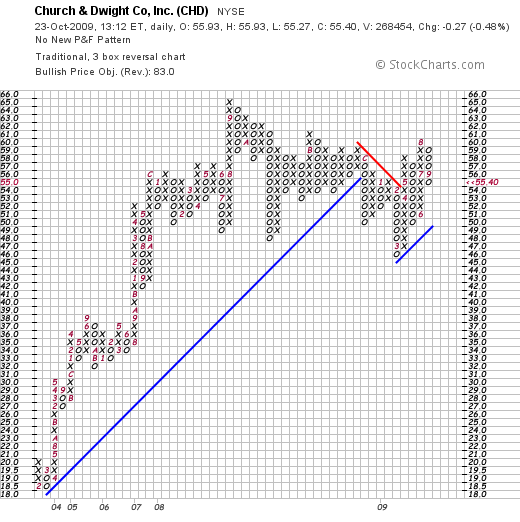 On a technical basis, Church & Dwight (CHD) is far from over-extended unlike that chart on Coke which gave me some short-term concerns. If we look at the 'point & figure' chart on CHD from StockCharts.com, we can see that this stock had a tremendous increase from $18.50 in February, 2003, to a peak of $65 in September, 2008. After dipping as low as $46 in March, 2009, the stock has been fighting higher but overall has spent about a year in this $46 to $65 range consolidating. One of the things that confirmed my choice of Church & Dwight (CHD) was the beautiful financial picture as reported by Morningstar.com. Looking at the "5-Yr Restated" financials on Morningstar, we can see the perfect pattern of steady revenue growth from $1.46 billion in 2004 to $2.42 billion in 2008 and $2.48 billion in the trailing twelve months (TTM), the steady increase in earnings from $1.36/share in 2004 to $3.00 in the TTM, the modest growth in outstanding shares from 68 million in 2004 to 71 million in the TTM, the steady growth in free cash flow from $139 million in 2006 to $400 million in the TTM, and the strong balance shee with $357.0 million in cash and $481.0 million in other current assets balanced against current liabilities of $500.9 million. Reviewing Yahoo "Key Statistics" on Church & Dwight, we can see that the market cap is a mid cap $3.89 Billion, the trailing p/e is modest at 18.41 with a forward p/e (fye 31-Dec-10) estimated at 14.41. Thus, the PEG (5 yr expected) works out to a satisfactory 1.35. Yahoo reports 2.52 million shares out short as of 9/25/09, representing a short ratio of 6.1 a bit more than my own 3 day arbitrary rule for 'significance'. The dividend of $.56 results in a 1% yield which is well covered with earnings with only a 12% payout ratio. The last stock split was back in September, 2004, when the company had a 3:2 split. As I noted above, the company just posted an announcement that 3rd quarter results are set for November 3, 2009, so there could be some volatility in the stock price around this announcement depending on how the company does relative to expectations and unknown 'whisper' estimates. Stay tuned. Meanwhile, I have chosen to swap from the fizz of Coke to the stabilizing influence of Arm & Hammer Baking Powder, the brilliance of Brillo, and the safety of a First Response Alarm! I hope that this swap makes sense and continues to work for me in this continuing to be challenged market environment.